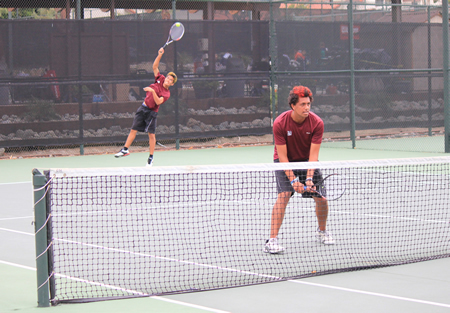 Ryan Gee (serving) and Hayden Seitz won two of Laguna’s six matches in the team’s 12-6 CIF finals loss to Redlands on Friday, May 22, at Claremont Tennis Club. Photos by Robert Campbell. The Terriers swept Laguna 9-0 in singles to dominate the Division 4 CIF final last Friday, May 22, at the Claremont Club in Claremont. Breakers completing their 81st season had advanced to the finals for only the ninth time in the program’s history. Breakers lose only one senior, doubles player Adrien Azera, for 2016 and should be among the favorites for the Division 4 title chase next year. 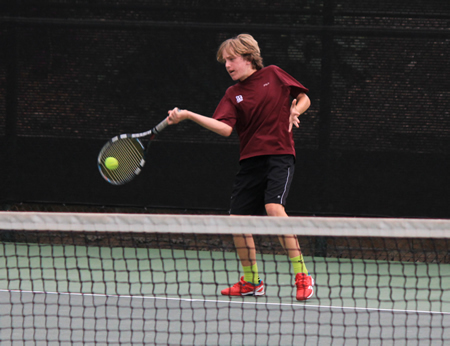 Charles Keller hits a forehand return against Redlands at CIF finals on Friday, May 22, at Claremont Tennis Club. The Breakers lost 12-6.